Simply stated, our secret pork rind recipe makes for the best tasting pork rinds around! It's the flavor of bacon in a crunchy bite all with zero carbs and more protein than boring peanuts. 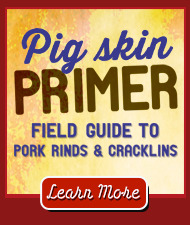 Try our pork rinds in recipes or right out of the bag. Crunch on! Nobody Makes Better Tasting Pork Rinds! We've been producing the best tasting pork rinds for more than six decades, still using the same secret recipe Mary Rudolph created in her family kitchen. Our propriety two-step process allows us to go from pork rind pellet to popped pork rind to bagged pork rind in just four minutes ... locking in freshness. With quality standards so high, you're ensured the best tasting pork rind around! Maybe that's why we are the world's largest manufacturer of pork rinds. Or is it the taste? 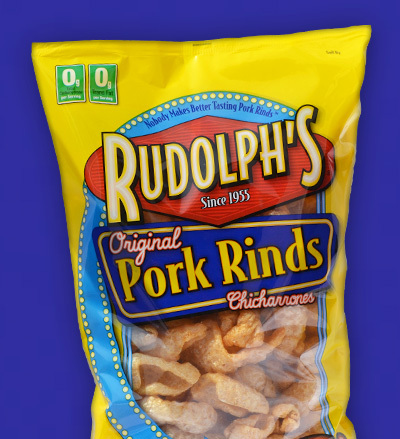 Either way, you'll enjoy Rudolph's pork rinds as a snack or as an ingredient in your favorite recipe. Enjoy! Pork rind recipes, promotions, funny stories and more!